TouchPlayer will run files created with TouchDesigner in Perform Mode only. TouchPlayer does not have a designer interface to author files, it is meant only for playback of TouchDesigner projects. TouchPlayer Non-Commercial is free of charge for non-paying, non-commercial uses. No license, key, or registration is required to download and use TouchPlayer in Non-Commercial form. This is a great way to share your work with other who do not use TouchDesigner. All they have to do is install TouchPlayer and run your file. TouchPlayer Commercial licenses can be used for paying projects and support the same feature set as TouchDesigner Commercial. It is available in the Store for $300 per license. TouchPlayer Pro licenses can be used for paying projects and support the same feature set as TouchDesigner Pro. It is available in the Store for $800 per license. TouchPlayer is included in the TouchDesigner installer. 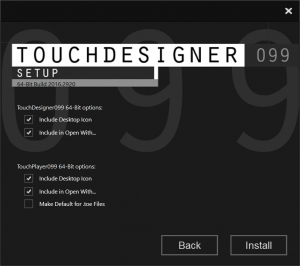 To install TouchPlayer, use the TouchDesigner installer and select Custom Install and TouchPlayer Options. After clicking Install there will be options for installing TouchPlayer. 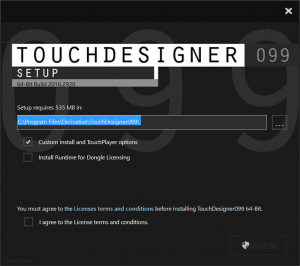 The TouchDesigner/TouchPlayer installer is available on the Downloads page. TouchPlayer opens any file type supported by TouchDesigner and runs in Perform Mode only. For .toe files, the perform mode settings are customizable by the author of the TouchDesigner file. There is a small control panel added to every TouchPlayer Non-Commercial window with controls for play/pause, fullscreen, Key Manager, help, and quit. This control panel is suppressed when using a Commercial or Pro license but can be accessed. TouchPlayer Non-Commercial will ask the user to confirm access to certain external devices (such as camera and microphones for video/audio input) and system services like web (via the Web DAT) or network (via the network operators). The confirm dialogs are suppressed in Commercial and Pro. TouchPlayer has the same system requirements as TouchDesigner. TouchPlayer uses the same installer as TouchDesigner. When you are installing TouchDesigner there are options for making TouchPlayer icons on the Desktop, adding TouchPlayer to the Open With... menu, and for making it the default application to open .toe files with. Start the installer and select Custom install and TouchPlayer options when prompted. Then on the next dialog of the installer, select the TouchPlayer (and TouchDesigner) options you want. Then click Install. 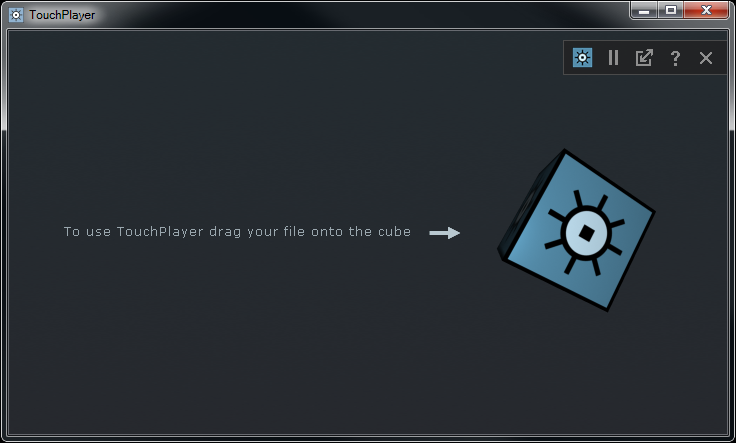 To start TouchPlayer, drag and drop any file you want to open onto the TouchPlayer desktop icon. Alternatively you can right-click on that file and select TouchPlayer from the Open With... menu if this option was selected in the installation process. You can also start TouchPlayer by double-clicking the TouchPlayer desktop icon (if this option was selected in the installation process) or selecting it from the Start > Programs menu. When opening TouchPlayer using these latter two methods, the TouchPlayer startup dialog will open as shown below. These features will not appear when using a Commercial or Pro license. Drag and Drop any compatible file into this dialog to open it in TouchPlayer. The main TouchPlayer window will have a small control panel in the upper-right corner of the window. click to enter and exit fullscreen mode. click to go to the TouchPlayer help page. Although TouchPlayer will play any .toe or .tox file, some guidelines and best practices should be followed. TouchPlayer runs on PC only, with the same hardware requirements as TouchDesigner. Test your files out on different computers if you are unsure who will run them. Be aware that the .toe file you distribute can be also opened and edited by those with TouchDesigner. If you want to protect your .toe file, you have to purchase Pro and set the Privacy flag on your .toe: Following that, others cannot open the .toe for examination in TouchDesigner. If your .toe file is created in your copy of TouchDesigner Pro with the Privacy flag on, then the file cannot be opened or edited by those with TouchDesigner. Media (images, movies, audio, data) can be embedded in the private .toe file using TouchDesigner’s “Virtual File System” (vfs). TouchPlayer's different licenses use the same feature sets as the corresponding TouchDesigner licenses. For a comparison of licenses, see Licensing. Be Aware that TouchPlayer Non-Commercial will open confirmation dialogs when it attempts to access network connections, the Video Device In TOP, or the Audio Device In CHOP. These confirmation dialogs will not open when using TouchPlayer Commercial or Pro. TouchPlayer will open all supported image & movie files, as well as .toe & .tox. 1. Run the application using the TouchDesigner executable instead of the TouchPlayer executable. The TouchPlayer Commercial/Pro license will still work inside of TouchDesigner, but the network editor will be disabled 2. Install a full TouchDesigner license on the machine or plug in a License Dongle. The network editor will become active for editing, you will not need to restart the file. 3. When finished, disable the TouchDesigner license or unplug the License Dongle. The application will fall back to using the TouchPlayer license that was installed previously.